I am the Curator of the Theatre Collection at the Free Library of Philadelphia, which is a research collection of materials on theatre and other forms of popular entertainment with a special focus on Philadelphia and Pennsylvania. When you count it all up, it contains over a million items, not only about theatre, but also about film, television, radio, the circus, minstrels, vaudeville, and burlesque. In addition to traditional books and magazines, we have programs, playbills, theatrical scrapbooks, posters, newspaper clippings, lobby cards, lantern slides, pictures of productions, and film stills. It is a lot to keep track of, but we do our best. Additionally, as the Theatre Collection is housed within the Rare Book Department (RBD), I'm also one of the librarians for the department as a whole. While we are all pretty much generalists, the collections I know best are RBD's Literary Collections and the Colonel Richard Gimbel Collection of Edgar Allan Poe. I run our Instagram account (here's a plug for @freelibraryrarebooks), so I try to be aware of fun and interesting things throughout our very varied holdings. Like all of our staff in RBD, I answer reference questions, give tours and teach classes, create exhibitions, work in accessions, make and update records for our Digital Collections, and whatever else needs doing on a given day. When I was getting my MLS at the University of Illinois at Urbana-Champaign (UIUC), rare books/special collections librarianship was not on my radar. I intended to be a reference librarian in an academic library, most likely in arts and humanities. Instead, in 2006, I began working in the Literature Department at the Free Library of Philadelphia. It was a great mix of subject specialty and public librarianship. Though the Theatre Collection was part of the Rare Book Department by this point, it was once part of the Literature Department and there was still a good relationship between the two. I was able to make visits and became familiar with the Collection, which planted the seed for wanting to work somewhere similar in the future. In 2008, I left the library to pursue my M.A. in Text and Performance Studies at King's College London, co-taught with the Royal Academy of Dramatic Art. I was able to visit the National Theatre archives and to focus my final thesis on the problems surrounding documenting performance. In 2011, when I was interviewing to return to the library, I made it clear that I would very much like to be in charge of the Theatre Collection, and they made it happen for me. I then completed my Special Collections Certificate through UIUC's distance learning program because I figured if I was going to be in the job, then I should probably take a few classes. I'm going to cheat a little and choose two, one from the Theatre Collection and one from the Rare Book Department. In the Theatre Collection, we have a scrapbook of playbills from the Arch Street Theatre from the early 1860s that was kept by Louisa Lane Drew (better known as Mrs. John Drew) while she was manager of "The Arch." She started her acting career when she was eight years old and continued to perform almost until her death at 77. She was the first female manager of a major American theater, and through her five children, she ultimately became the matriarch of one of the greatest acting families of all time: the Barrymores (she is the great-great-grandmother of Drew Barrymore). In the Rare Book Department, we're lucky enough to have a Shakespeare First Folio. It's particularly special as it's complete and has marginalia that's been dated to prior to 1670. There are annotations, bracketing, and underlining that correct perceived errors, highlight passages, and point out textual variants. My favorite is that the prologue to Romeo and Juliet, which is absent in the First Folio, has been written in on the bottom of the previous page. It's a good thing the ending of Titus Andronicus didn't take up more space! As you might imagine, I have a lot of books of plays and theatre theory and history. There's nothing particularly special about them, other than the sheer amount. I'm lucky that acting editions of plays are so thin, meaning they don't require as much bookshelf space. I also have a special place in my heart for all things Alice's Adventures in Wonderland and Through the Looking-Glass. When I was seven, the first theatre production I was in was an adaptation of these stories. I was the end of the caterpillar and the iris in the flower garden. So, I collect editions with interesting bindings, older editions that I can afford, and books with alternate illustrations. While I love the Tenniel illustrations (enough that I have three of them as tattoos), I enjoy seeing new interpretations of the characters. Reading, obviously, traveling, and seeing live performances. But I also really love cooking and baking. Though their waistlines might wish otherwise, I'm regularly bringing something sweet I've made into the office with me for my co-workers. I'm fascinated by the science behind baking and enjoy tinkering with recipes to see how I can make them my own within the parameters set out by the chemistry involved. I may also have a slightly unhealthy love of cooking competition shows, particularly those from Australia. Being a librarian of any kind is about people. Yes, it's also about the materials we work with, but what I do, what all librarians do, is match patrons up with those materials and give them the tools to find items they need in the future. I love seeing the excitement on someone's face when they see all the typefaces on a 19th-century playbill or the shimmer of gold in a medieval manuscript or their ancestor's name on a Pennsylvania German fraktur baptismal certificate. I love hearing someone say "this is exactly what I was looking for," especially if they came in unsure of what they needed. It's also great to find amazingly neat things almost every day. For instance, I opened up a box I thought held spare tissue paper only to discover a rhinestone-encrusted headdress that was worn by actress and dancer Gilda Gray in the 1922 Ziegfeld Follies. And no, though I was very tempted, I didn't try it on. I regularly email non-library friends saying things like "my desk is covered in colonial money." Their response is usually something along the lines of "your job is awesome and also weird." I'm very interested in the use of disruptive technologies in how we can better provide access to our materials. I was fascinated a few years ago when both Cornell and Colgate scanned and 3-d printed copies of their cuneiform tablets. I think there's work that can be done with OCR (optical character recognition) and ICR (intelligent character recognition) that would allow us to expand crowdsourcing projects by getting data points extracted that can then be verified by crowdsource participants. There are museums doing tours interactive tours for visitors at a distance with robots. All around, I think there are technologies in other sectors (business, science, etc.) that we could be experimenting with in the library field. And I look forward to getting to play with them, especially the robots. 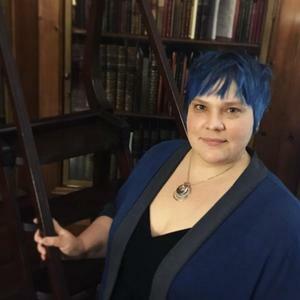 Since I've already mentioned a number of the collections we have in the Rare Book Department, I'll use this opportunity to talk about some of the other special collections at the Free Library. We have the Children's Literature Research Collection, which houses more than 85,000 books published from 1837 to the present and archives of local children's authors and illustrators; the Map Collection, which has more than 130,000 current and historical maps covering every part of the world; the Edwin A. Fleisher Collection of Orchestral Music represents the largest lending library of orchestral performance material in the world, housing more than 22,000 titles and continuing to grow; and the Print and Picture Collection, which is home to fine art prints, photographs, drawings, and artists' books, as well as extensive research collections of Philadelphia images. In the Rare Book Department, we have two exhibitions up currently: In Our Nature: Flora and Fauna of the Americas in our William B. Dietrich Gallery (open through Sept. 15th) and what we call our Treasures exhibition in cases throughout the rest of the department. Exhibitions in the Dietrich Gallery are our themed exhibitions and change about every six months. The next one is Philadelphia: The Changing City, which looks at planned and unplanned changes to the city and how they have affected Philadelphia's landscape, buildings, and inhabitants. It opens October 10th. Our Treasures exhibition features items from our various permanent collections, including, but not limited to, cuneiform tablets, medieval manuscripts, incunabula, early children's books, Beatrix Potter, fraktur, Americana, Charles Dickens, and Edgar Allan Poe.